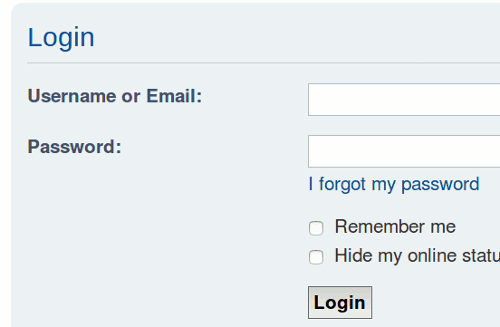 Db_email: To login with email (and password). 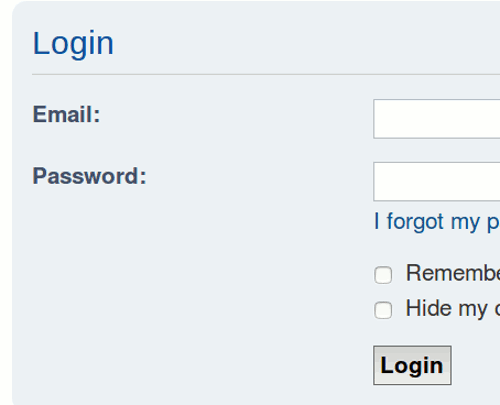 Db_username_or_email: To login with username or email (and password). After installation, one of these can be selected in the ACP: General > Client communication > Authentication. Only users with a unique email address in the database will be able to login. It is recommanded to check beforehand if all email addresses are unique. When you left the configuration option "Allow email address re-use" in the ACP (General > Board configuration > User registration settings) to the default "false" in your board, this will be the case. The provider Db_username_or_email checks first if the input is in the form of a valid email address. If yes, the user is identified by the email address. Access to the ACP remains with username and password combination. Last edited by martti on Sun Feb 03, 2019 10:36 pm, edited 5 times in total. Loving these small addons here and there. I thought there was something similar for 3.2 already, or did you have to edit core files? I remember getting it to work last year for someone but forgot how. Good work! Yes, I like to keep extensions small and doing one thing: that provides maximum flexibility, focus and maintainability. did you have to edit core files? No, then it wouldn't be an extension. But are the messages correct? Core error messages are re-used. The new authentication providers are extended from the basic database provider in core. Only specific messages to this extension are new. If you use Db_username_or_email and you fill in something that is not in the form of an email then the extension passes the authentication directly over to the default core one. Unless you don't fill in anything at all, then you should see an error message from the extension itself. There are some logs added for debugging. Those are to be removed later.